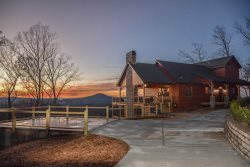 Conveniently located for quick access to Blue Ridge and Ellijay you won’t miss any of the wonderful events and activities in the North Georgia Mountains. Acorn Bungalow is a charming and quaint one bedroom cottage, the perfect place to escape the worries of life and enjoy mother nature. For the hiker you are just steps away from the Benton MacKaye hiking trail. Let all your stress melt away while sitting in the Hot Tub among nature or sit on the screened porch and enjoy your morning coffee while listening to the birds chirp. Enjoy some s’mores and hot dogs around the fire and talk about the day’s adventures. With paved access the cabin is motorcycle friendly and of course dog friendly. The home has a King Master bedroom and the loft has two twin beds to sleep 4 comfortably. The kitchen is fully equipped with a compact stove and refrigerator, everything you need for your stay in the mountains. Don’t miss out on the many unique activities and outdoor experiences North Georgia has to offer. Meander the streets of Blue Ridge or Ellijay, where you will find one of a kind shops, breweries and eateries. Take a ride on the Blue Ridge Scenic Railroad, Hike the Appalachian Trail, Visit a waterfall or swinging bridge, Tube, Kayak, Paddle Board or White Water Raft the Toccoa or Ocoee River’s. Go boating on Lake Blue Ridge or step back in time and watch a first run movie at the famous Swan Drive-In Theater. And of course Mercier Orchards is a must. There is always a festival or event happening here in the mountains. Always a pleasure to stay with Mountain Laurel! We've rented from them for over 5 years now and have no complaints. The cabins are always clean and their reservation process is simple. We enjoyed our stay. The cabin is comfortable and has everything we needed for a weekend away. We also loved the affordability of the cabin. The cabin was wonderful. It was warm, easy to live in, and dog friendly. When I needed help the maintenance man was quick, efficient, and friendly. Thanks!! Cozy, romantic, private and memorable! Our stay was pleasent and look forward to returning!! Drove up from central FL . We own a cabin in the white mountains N.H. so came here for a fix. Loved the cabin. Plan to return here often , as it is much closer than New England!! We enjoyed our trip to the Acorn cabin for Thanksgiving. My husband and I live and work in different states so this was a nice central meeting spot for a holiday getaway. It was a cozy much needed visit together. Made for a great 1 on 1 trip. Loved the fire pit, hot tub and the view!! The cabin was clean and had everything we needed. Online pictures were accurate. The cozy Acorn Bungalow was very pleasant and we were very relaxed there. It is worth the long hard drive. I miss the mountains already! Excellent time!! Short drive, will return! My wife and I enjoyed a relaxing stay at the Acorn Bungalow. It was clean and had everything we needed for a weekend away from Atlanta. We highly recommend it!! Stayed for 3 nights. Was perfect that a few bare necessities were provided for a short stay. Good fridge/freezer size. Cute cabin, well decorated in woods theme. Screened in porch to keep creatures a little more at a distance. Amazing cabin! Strongly recommend for quick getaway from the city.